Lady bugs weave an intricate trail on this tree. 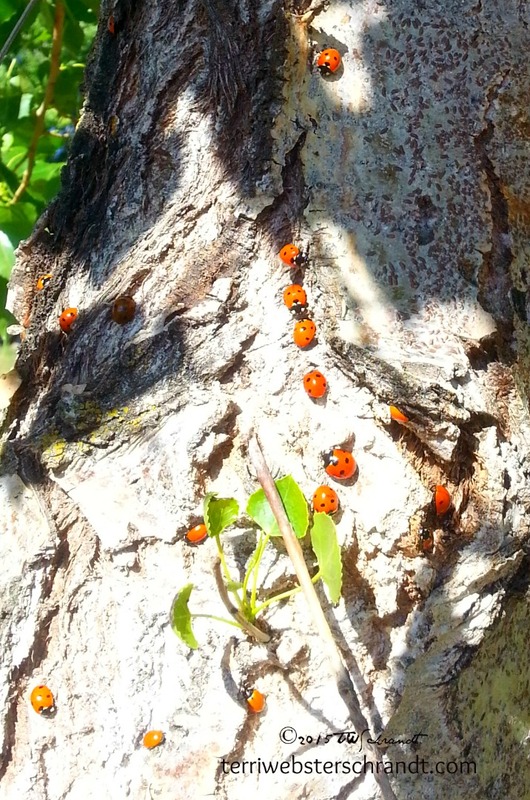 These lady bugs, (actually Asian Lady beetles) swarm at the river’s edge on the sandbags we use for our windsurf launch. Why do lady bugs swarm? Read more about it here. Remember, these beetles are beneficial and eat aphids and other hateful bugs that plague our gardens. Join me at The Clinic–PhotoRehab101 hosted by my buddy Lucile DeGodoy! Lady bugs are so cute! I’ve never seen so many at one time in person until I lived in the mountains of Virginia. We lived deep in the woods, so lady bugs came out in droves like your photo above. Thanks for sharing your photos at Inspire Me Monday! Ladybugs are awesome. They are some of my favorite insects to photograph. I LOVE lady bugs. Now you got my intricate mind for the simple beauty of a bug. The males look like the females. I think of that movie “It’s a Bug’s Life” with the gravelly-voiced male ladybug, LOL! Oh darn! I didn’t see the movie! Sounds cute. Terri! I love ladybugs: ) your post heralds in the start of spring too! Sorry for replying so late.. It’s proving to be a busy week at work! Cheers to you my friend and happy Wednesday! Yes, these little critters don’t scare me at all! Oh a bee swarm photo? Hmm, very interesting and a bit scarier! Thanks, things are starting to slow down and I’m catching up on reading blogs 🙂 Something I love to do! I’ve never seen so many ladybugs! I don’t know what it is about them that makes them so sweet, I am not a fan of creepy crawlies, but I’d happily pick one of these up and watch it wonder across my hand! Me, too, Laura! These bugs I can handle! Such beautiful snaps of such lovely creatures! And speaking of lovely, I think your new photo is great too! You look SOOOO Happy. Glad to hang with you in the clinic. I am working on another ‘in-clinic’ post right now. Should be out shortly! Oh, thanks, Lisa, for your nice compliment! I had just won that hat in a raffle. I will certainly check out your post! Beautiful pictures. We call them lady birds in the UK. Somehow, they don’t seem as creepy-crawly as other insects. Thanks, Debbie! I’ve heard them referred to lady birds; funny name, huh? I have never seen them other than individually! Amazing! So beautiful, Terri. The photos and the very important reminder on their mission. Let’s let them alive! They are very cute too. Thanks for bringing it to the photo rehab.